The latest update to ArcGIS Pro has just been released. I’ve been trying out the updates over the last few weeks and I’m excited to share a selection of what’s new in ArcGIS Pro 2.3. There are lots of interface updates within ArcGIS Pro 2.3, bringing clearer icons and cleaner menus to make getting to the tools you need easier. You’ll notice this as soon as you open ArcGIS Pro after the update; the opening page has been rearranged putting templates in the centre of the page. The user can also pin templates to the top of the list. A new Insert Report tool is included; which adds a new report statistics layout option that summarises data, giving users the options to pick the attributes and summary statistics displayed. The report works in a similar way to the Screening widget that you may be familiar with from ArcGIS Online WebApp Builder. The Reset Panes button is a welcome addition, allowing the user to quickly switch between predefined pane layouts for different actions: mapping, editing or geoprocessing. When working through a project being able to reset the display when moving on to a new action is helpful. Business Analyst Online has now been added to the analysis ribbon to streamline the accessibility of this functionality. There are a selection of visualisation improvements to give more freedom to users when creating maps and they will hopefully lead to even more insightful cartographic portrayal of data. Multiple definition queries can be applied to feature layers and tables. Colour ramps can now be applied to polygon outlines to show variance between different areas. This can be useful if there is data behind the polygons that needs highlighting. In this example, I’ve shown how building area can be portrayed with the new symbology options. Additionally, there are 41 new colour ramps to take advantage of. Layers can now be clipped to feature shapes through map properties. In this example, I’m using a country outline to only clip features within that country, leaving the basemap and the ocean layer. I’m most excited about the inclusion of the Equal Earth Projection System in ArcGIS Pro 2.3. It’s a brilliant projection, showing continents and countries at their true size relative to one another. In addition to equal-area throughout, it retains a shape similar to that of other projection systems with curved sides suggesting the spherical nature of Earth. Comparisons between locations should be possible with straight parallels along latitude lines. Additionally, the projection system allows users to centre their maps on the Americas or Asia for different global viewpoints. I’m looking forward to the maps and visualisations that the Esri community will produce using Equal Earth. There is a new extension available, LocateXT, which provides the ability to extract geocoordinates, place names and critical location information from unstructured data. This extension supports a variety of document types on release: Microsoft Office documents (Word, Powerpoint, Excel), Adobe PDF, XML, HTML, Text and more (including text from social media). For example, this could be reports with standardised introductions to each section or a bullet pointed list. Users could take advantage of this new extension by adding messages from fieldworkers to maps without pre-processing, saving time before analysis takes place. Data management and editing tools have had several updates. Contingent Values have been added – in simple terms this means after domains have been assigned to multiple attributes they can be linked. A user can then add data choosing a domain value then when choosing a value in another attribute field only certain domain options can be added. For example on a polygon layer for forest blocks - after a forest type (deciduous) has been picked, only deciduous trees will show in the tree species field. Within the editing tools there is a new modify feature tool called Divide. This allows the user to divide a polygon or line into smaller features through various methods: proportional area, equal area, equal width – with handy prompts to preview the changes before you confirm your edits. I’ve been impressed with the charting functionality of ArcGIS Pro currently available. 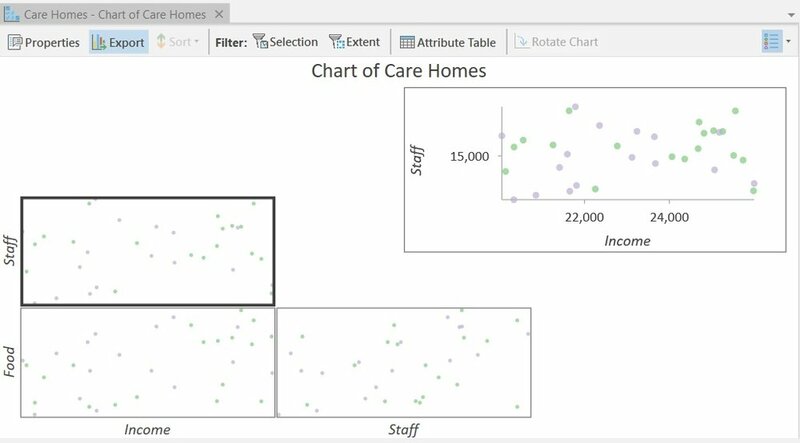 This update brings the Scatterplot Matrix with the ability to add multiple data points to a single chart and cycle through which fields are visible. This allows for quick comparisons between the data samples and can inform your decision on which data set needs to be analysed further. Users can also add a third variable to scatterplots to create a bubble plot – take a look at the example below. Chart themes can also be saved so that styles can be replicated during the creation process. Building upon past updates, 3D tools have been improved in ArcGIS Pro 2.3. You can now interpolate between 3D data points to predict the values of all locations between points in a 3D space using the new Empirical Bayesian Kriging 3D tool. A new 3D measurement tool has been added which can measure distances across a 3D space - this should be beneficial for a variety of uses. The annotation type, Dimensions, has been added to ArcGIS Pro offering the ability to quickly show specific lengths and distances on a map. It could be used to indicate the length of a side of a building and has options for the illustration techniques to show various elements in different views. This update has brought changes to the sharing options. The addition of Offset Printing gives new options for map arrangements and spacing. There are also improvements to the colour settings within print options. Sharing as an image now generates an image that matches the current view. The Layout view has had some updates, with improvements to text formatting options and new this release – a spell check tool. 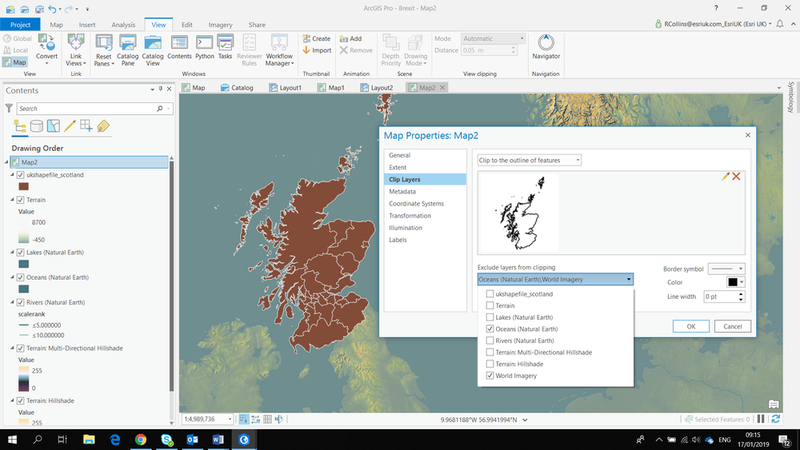 And much more to discover..
ArcGIS Pro 2.3 has more on offer than the features mentioned in this blog, I counted over 75 new features! You can learn more in the What’s New in ArcGIS Pro 2.3 guide.